Obstructions represent real-life obstacles and boundaries such as rigs, islands and shallow areas, national boundaries and marine reserves that vessels must avoid, or where vessels must behave in a more cautious manner (for instance, by travelling more slowly when nearby). Each obstruction in Seafloor Planner has a set of avoidance properties, allowing vessel behaviour to be controlled within the obstruction’s seafloor and surface safety margins. 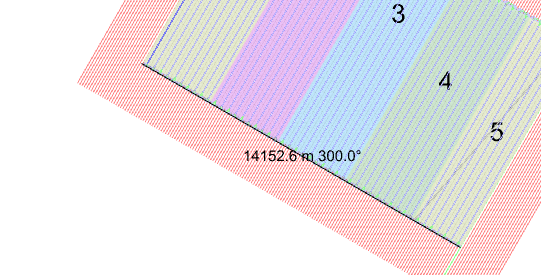 Currently, circular and polygonal obstructions can be defined within Seafloor Planner. 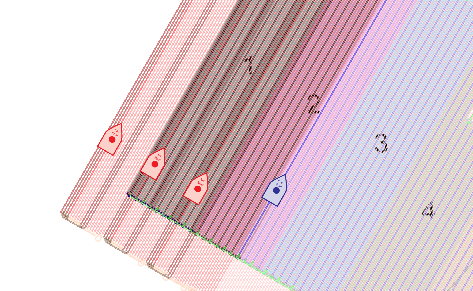 In future, obstructions will also be importable from shapefiles. This is an initial implementation of Seafloor Planner’s obstruction capability, and we encourage feedback from users. Initial support for multiple source vessels. Add or delete extra vessels on the Vessels tab of the Survey Configuration dialog. Each vessel can be configured separately, with its own speeds, costs, etc. The turn patterns for multiple vessels working together can be set on the Turn Patterns tab. This is an initial implementation of Seafloor Planner’s multi-vessel capability, and we encourage feedback from users. Use the new measuring tool to find the length and bearing of a straight line drawn on the map: Hold down Ctrl, and click and drag to measure. Usability: Optimization dialog Stop button renamed to Finish. Fixed: Receiver lines sometimes laid in an inefficient order, when lines are imported from a file. Fixed: ‘Minimum receivers’ considered to be number of receivers for whole survey, when using the ‘SPS X Relation File’ survey type. Fixed: Indent Repeats property sometimes visible on Templates tab when it should be hidden. Fixed: Crash if SFP attempts to optimize a survey where there is a patch with no shots in range. Fixed: SFP doesn’t generate patches when loading a patch-based XPS survey. Fixed: Missing XPS files error is sometimes incorrectly displayed. Fixed: ‘Receivers file does not exist’ error shown when attempting to view the survey configuration dialog without reloading the receivers file.